SnowyBliss: Feeling Lucky? It's a give away!!! 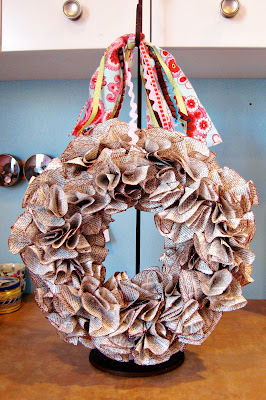 After making all those fun pom poms for valentines I wanted to attempt one as a wreath. The timing is perfect because I was hoping to add a few additional inexpensive accents to my easter decor. Here's how they turned out. I made two. I couldn't decide whether to go with conventional (ruffles all the way around) or go with something a wee-bit quirky (inspired by these divine shirts by Eliza and Axle). Now that they're done I can't decide which one I like more. This works out to someones benefit... because now I have one to give away. Yup... my first (and possibly only) give away. Entering is easy...simply comment which wreath you dig more, (conventional or quirky) and you're entered. Woo hoo! And it gets better... your chances of winning are super dooper high! I've only got a handful of readers. So really... what's to lose? Let's start with the "conventional" style. 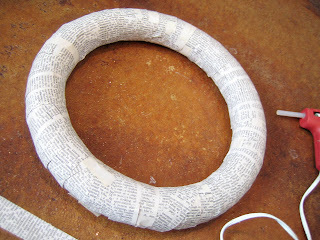 I cut about 65 six inch circles out of an old dictionary. I slid the edge, all the way around, through a small puddle of glue. Pour glitter on top. Turn the circle around to coat. Add glitter as needed. 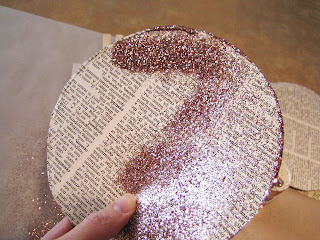 Flip over circle and glitter the opposite side. 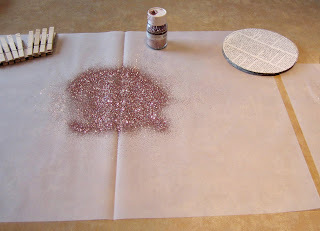 When pouring the glitter on the circle, do it over a large sheet of paper (you could use tracing paper, wrapping paper, mailing paper, I used drawing paper... just make sure it's big enough to catch all your left over glitter). 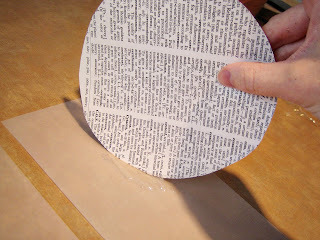 Crease the paper down the middle. 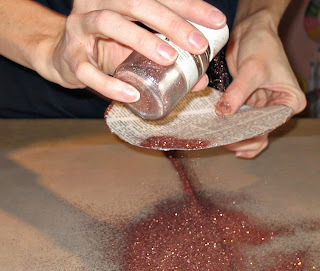 Then you can easily pour the excess glitter back into the container. 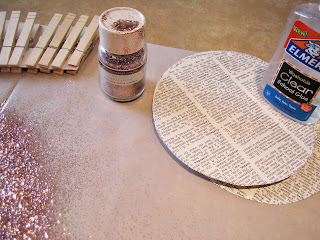 I used martha stewart rose quartz glitter (from Michaels) for this project. 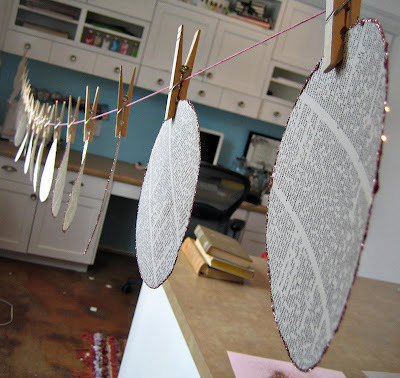 After a circle is glittered, hang it to dry. I used clothes pins and string. Once dry pinch the circle in the middle. Then just keep folding it in. Then staple it at the base. Voila! Then prep your wreath form. 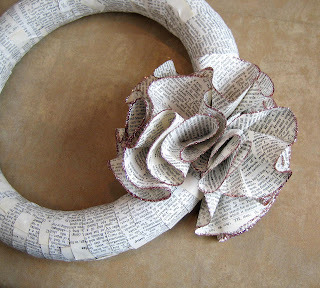 I used a 12 inch round styrofoam form ($4.50 at Hobby Lobby and JoAnns) Wrap it in strips of the dictionary paper. I just used the glue gun and stuck it on. No need to be perfect. You aren't going to see much of it. 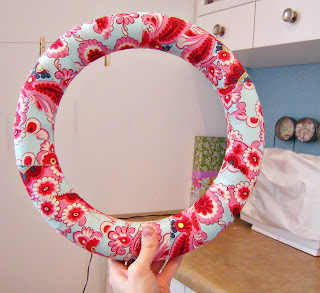 Then start adding your ruffled circles. I would put a couple on the outside and inside and then fill up the middle. Then start over...a couple on the outside a few on the inside and then fill it up in between. I again used the glue gun. Occasionally I'd add a staple from my staple gun for extra security. Especially the outside ruffles. 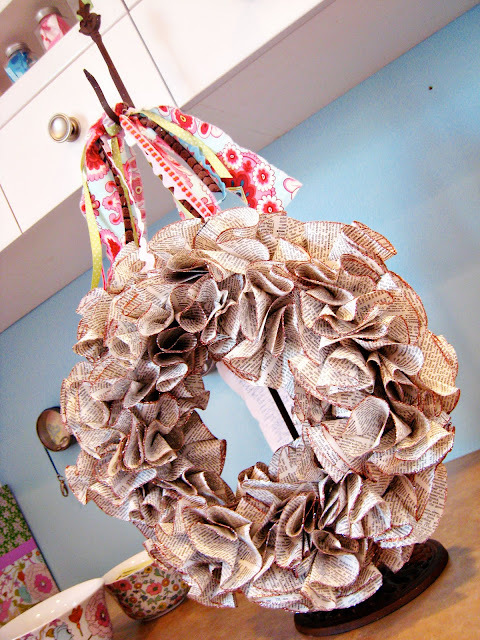 Make sure you hold each ruffle in place until the glue has cooled enough to stick to the wreath. (Here's what the back looks like). Then add what ever ribbon you want to hand it with. 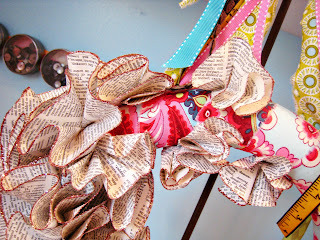 I use ripped strips of leftover fabric and ribbon. I tie it all in a knot at one end and glue and staple it on. And you're done! It's basically the same. Instead of just 6 inch circles. I made some 6", some 5" and some 4". I think I used about a total of 30 circles. 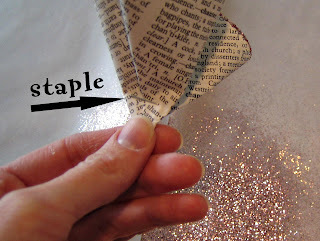 Glitter them the same way. 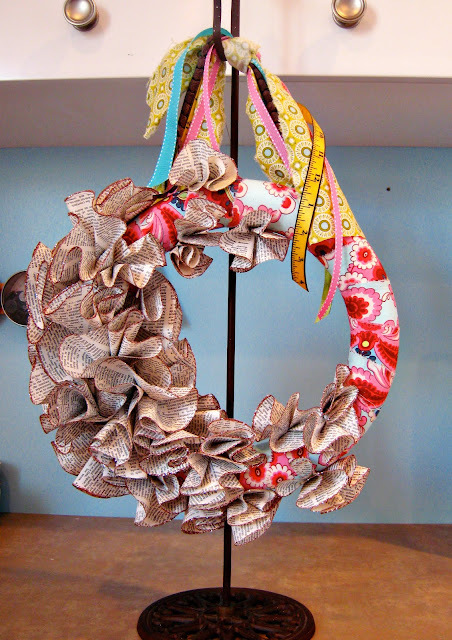 I covered this wreath form in strips of torn fabric. 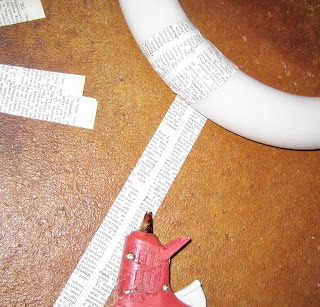 I started with gluing one end on what would be the backside of the wreath. I added a couple staples for security. Then I wrapped it... pretty tight so it would smooth out. I only added glue to the backside... I was worried it might make it lumpy on the front. After I glued, I'd pull it fairly tight again and wrap again...glue then wrap...glue then wrap. 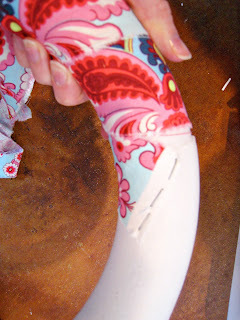 Add a new strips of fabric as needed. 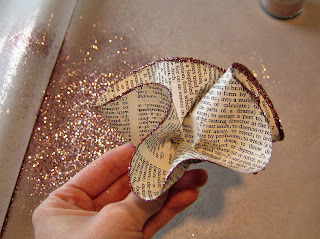 Then add your paper ruffles. Start with the biggest. Then add the medium circles to each end. Then the smallest to each end. Add ribbon to hang and your done. I'm thinking these would look spectacular for halloween. Black glitter, a square wreath, wide satin ribbon and a crow perched in the corner. Gorgeous! Alrighty... don't forget to enter. And seriously... anyone is welcome to enter, long lost cousins, friends of friends, complete strangers, my best friend's sister's boyfriend's brother's girlfriend who heard from this guy who knows this kid who's going with the girl who... (name the movie folks;)) you get the idea. (I'll close the contest sunday evening and announce the winner monday morning). Sure I'll make one for you... but so far things are looking in your favor to win;) It's funny, J likes the conventional, but you know me... I'm a little bit more "funky." Oh my, pick me! Pick me! I'd also have to say conventional because I'm kind of a conventional gal ...even though is absolutely wish I was quirky. These are amazing! Um, Ferris Bueller is the answer. And, I like the Quirky one, even though I'm really not. So there. They are both fabulous, just like you! HI, My name is Natallee. I am a blog stalker of yours. I love your blog and all your amazing ideas. you have great style! I would love to be entered for your give away!! Ooooh, a blog stalker. That makes me feel so cool;) Welcome Natallee! Ooh ooh pick me please! I like the funky one. If I could only wander around in your creative mind for just a moment. Anj, you are fabulous. I love this idea! 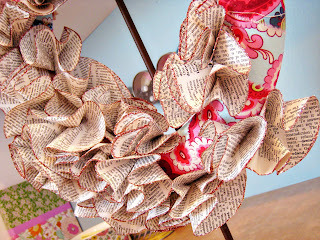 Do you think these could be made with other paper too? Like something colored? I'm curious to try it out! You sure could use other paper. I think you'd want to find paper that had a print on both sides. And I wouldn't use paper that's too stiff. 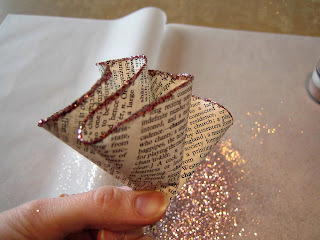 You'll want it to have some give to create those petal like ruffles. 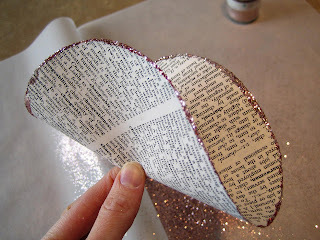 Fabric would work as well, (felt would be great) but I'd skip the glitter with it. FYI... the dictionary was 2 bucks at the D.I. 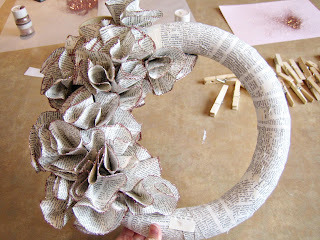 And two wreaths later I had only just cracked the letter D.
I'm going to have to say Ruffles, Ruffles and more Ruffles. (But mostly because I read your other comments and Quirky seems to be what everyone else is saying and since I have this problem... serious aversion to going with the flow- its runs in the family- I'll have to say the Uber-Ruffles... and actually I think they are both amazing!) That was a really long parenthesis and I'm pretty sure there's an English teacher out there somewhere saying, tsk, tsk, tsk. I would love to have an original "Anj" hanging in my house. I love them both but would have to say conventional would probably match my decor better. but I would do both. It's a very tough call Anj, both are amazing! I'm going with traditional. Oh I think I changed my mind and have to say quirky! That is just soooo cute! I love it!!! I am going to say quirky - although I love them both! I'll put your giveaway on my sidebar! Love your blog! Brilliant - I absolutely LOVE the look of those! And such a great, step-by-step tutorial - thank you!! 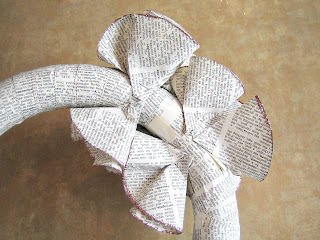 Do you think this would work using newspaper instead of dictionary pages? Or would they not be stiff enough? ARGH!!! Well I'm YEARS too late to enter the Give-away but wanted to let you know I love the conventional one! Beautiful work ~ thank you for sharing!